I am always looking for new dairy-free modified recipes that I can make at home. I have been searching for a whole-wheat and milk-free pancake recipe for some time now. 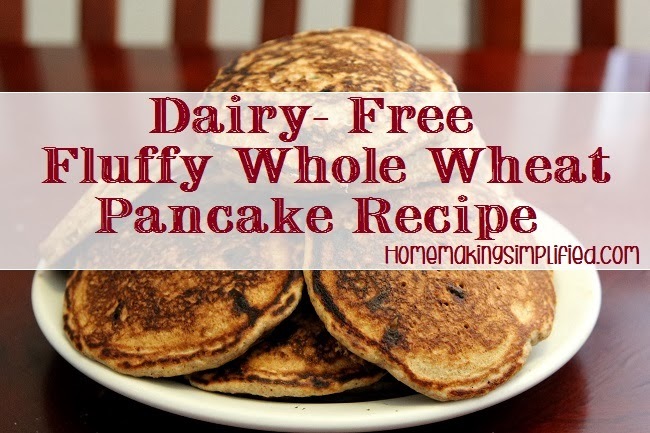 Being unable to find good one, I have been tweaking other dairy-laden whole-wheat pancake recipes in attempt to find a tasty, healthy, yet fluffy, dairy-free whole-wheat pancake recipe. After a little trial and error, I was able to make exactly what I was looking for! So without further ado, here it is! Makes approximately twelve (12) 4 inch pancakes. Mix together all of the dry ingredients (flour, sugar, salt, baking powder, baking soda). Next, mix in eggs and dairy-free "milk". Mix well. Feel free to add in some mix-ins. We added in some organic fair-trade chocolate chips to this batch. Heat a griddle (or pan) and lightly coat with an oil of your choice, such as coconut oil, between each pancake. The batter will be thicker than commercial pancake mixes. But if it seems a little too thick, adjust milk amount accordingly. Cook until golden brown and then flip once. Top with your favorite maple syrup. We love organic grade B maple syrup (want to know the difference between grade A and grade B?). I really liked this recipe so I made extra batches of the dry ingredients and stored it in a gallon sized Ziploc bag. How to Easily Wash and Dry Your Rugs without a Carpet Cleaner! (C) 2013-2018. Gabriela Gammo. Simple theme. Powered by Blogger.